Farming is my family’s heritage and a part of my DNA. My father is a farmer and so is his father. No, I am not a farmer, even though I was born and raised in a farm. I had a wonderful childhood and a strong connection with the nature. I loved my freedom and running around the fields. I also liked to spend my days with my dad in his tractor. Growing up in the farm gave me hard lessons as well. I’ve seen my family work very hard till late hours. My dad, my mentor – a person who taught me the most valuable things in my life – was disappearing for days during harvesting seasons and was stressed about piles of paperwork and economical struggle. It didn’t seem fair to me. As I got older, I started looking for clever ways to help my dad. Growing up in nature provided me the best classroom to nurture curiosity and learning. Just like many other farmers, my father used excel spreadsheets to fill out the government reports, which – in my eyes – had been stealing the time I could have spent with him. Over many years he had to enter the same information into ten different systems! As I had learned a bit of programming in school I decided to take a challenge and create a software that would contain all the information my father needed to run his farm. 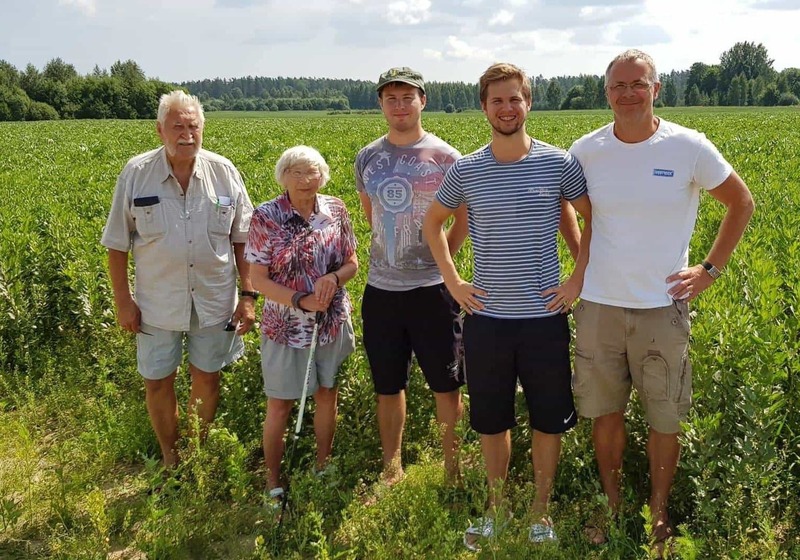 It wasn’t easy, but I was optimistic and persistent enough to achieve my goal and soon the first version of our software was ready to be tested in my father’s farm. One day, government inspectors walked into our father’s farm and were genuinely surprised to see such program and recommended me to show it to other farmers as well. I had found my way to express my love and passion for farming and farmers! Officially, eAgronom started with 3 people on board in August 2016. From the beginning, our priority has been a constant conversation with farmers and implementing their feedback into new features – we have recieved feedback from over 200 farmers in the process! 6 months after the launch, in January 2017, we already had 200 000 ha of grain fields managed in eAgronom. It means that we had captured 70% of the Estonian market share! This was a confirmation that our application was useful for farmers and gave us the motivation to continue our work. Feedback isn’t all that farmers give us. We have also raised investments from over 50 independent farmers. Today, we are active in Estonia, Latvia, Lithuania, Poland, Slovakia, Czech Republic and Germany and we have raised over 1M €. Along the way, I never lost my original motivation to raise my father’s leisure time and profits in the process. In 2017, his profit were up 338%, compared to 2 years earlier and he spend 20 000 km less driving around his fields thanks to eAgronom! We believe that farmers play a crucial role in the society as food production is the biggest industry in the world. Currently, eAgronom users already provide food for over 3 million people! Thousands of farmers trust our solutions and technological advice. We are honored, that they have chosen us as their gateway to technology. We want to use this position and empower farmers with technologies of the digital age, and eventually automate the entire food production. My father has higher profits, more time for our family and business innovation. We aim to bring those benefits to every single grain farmer in the world.